High Selling 2018 Mare - Long Quarter Horses, lot 10, $2,800 sold to LeAnn Bender. 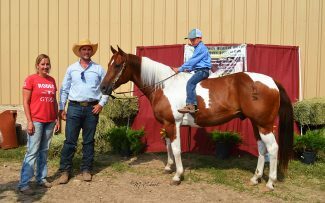 High Selling invite horse, consigned by Jeremy Langdeau, sold for $15,500 to Doug and Lorraine Kissack of Spearfish, SD. Location: Beslers' Cadillac Ranch, Belle Fourche, S.D. Top 10 Riders – $8,600. The 18th RBQHA sale was well attended on a beautiful day in western South Dakota with an excellent crowd of buyers who came from multiple states to select from over 80 head of weanlings, yearlings and riding horses. It has been an incredible year for moisture and the positive summer carried over into a positive sale. Unique to this sale is the weanling showcase; that let's potential buyers compare foals side by side. Saddle horses are shown on cattle, barrels or ridden prior to the sale. The day started early with the RQHBA Ranch Horse Futurity with riders competing for $2,600 in prize money. This futurity is open to any weanling sold through the sale with all horses completing a judged pattern. Winning the Two Year Old Class was Becky Amio on Harlans Yamani, bred by Hancock Maxon Quarter Horses and owned by Richard Welsch. Winning the Three Year Old Futurity was Ryan Smith riding Charcoal Freckles bred by Joan Johnson Quarter Horses. The week before at the Central States Fair the Don Brunner Memorial Yearling Futurity was held with $3,000 in prize money awarded. Winning the Yearling Filly Class was Boons Quioxte Miss owned by Cecile O'Neill and bred by Mailloux Quarter Horses. The Yearling Gelding Class was won by Driften Yellow Jack, owned by Sonya Coolahan and bred by Bender Ranch. 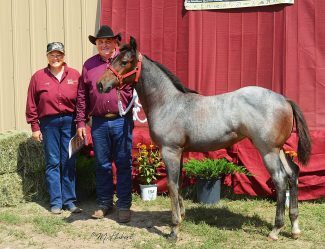 The Yearling Stallion Class was won by Boonys Skeets, owned by Sonya Coolahan and bred by Shield Five Quarter Horses. Chaffee Herron Ranch, lot 15, $4,750 sold to Lorence Edoff. Woods Performance Horses, lot 20, $3,800 Besler Cattle Co.
Long Quarter Horses, lot 10, $2,800 sold to LeAnn Bender. Bender Ranch, lot 40, $1,500 to Jeremy Langdeau of Rapid City, SD.